D.Gray-Man volume one collects the first seven issues of Katsura Hoshino’s on-going manga series. Lost a loved one? The Millennium Earl is here to help! Simply provide the Earl with the relevant details and he will raise the spirit of your loved one, installed in a wonderful robot body. The robot is an Akuma, a self-evolving homicidal killbot bent on the destruction of all humanity. Think of it as a more genocidal version of Pokemon. Aware that humans would not willingly participate in their own annihilation, the Millennium Earl focuses on the “bring back from the dead” angle while withholding the “as a homicidal rampaging killbot” details. The Earl prefers that the killbot come as a delightful and very final surprise to the bereaved … and anyone living within a few miles of them. In most cases, his plan works. Allan Walker knows exactly what the Earl is up to, because Allan was one of the dupes who believed the Earl’s promises. Unlike the vast majority of the Earl’s patsies, Allan survived the immediate aftermath of the transaction. Allan’s deformed left arm was revealed to be a weapon of prodigious power, one able to strike down the killbot. Adopted and taught by General Cross, Allan is adept in the ways of the Black Order exorcists, an organization of warriors each in possession of some device imbued with “Innocence,” a quality that turns out to be effective against killbots. For reasons of his own, Cross has taken his leave of Allan, leaving the young exorcist to travel the world in an endless quest to find and destroy killbots. Occasionally Allan even manages to save bystanders, although that is not the way to bet. Now the time has come for Allan to travel to the central headquarters of the Black Order, to better acquaint himself with his allies in the struggle against the Earl. This manga is set in an alternate version of the 19th century. I suppose this might be taken as hopeful. It might suggest that humanity survived into a 20th century. On the other hand, our 19th century didn’t have demonic robots, so who is to say that there will be human 20th century? This manga is not my thing. I was mildly intrigued by the fact that Allan manages to have some empathy for his enemies, but not enough to look for further volumes. Part of my meh is due to the artwork, which was clunky to mediocre. Part of the meh is that Allan’s magical arm (which expands or contracts to any size necessary) seemed implausible. Yeah, it’s a magical weapon and doesn’t have to be plausible, but something about it bothered me. I also didn’t see how this series could come to any good end, given that the exorcists are working on the symptoms (the killbots) and not the cause (the Earl). Ah, well. I cannot like everything. 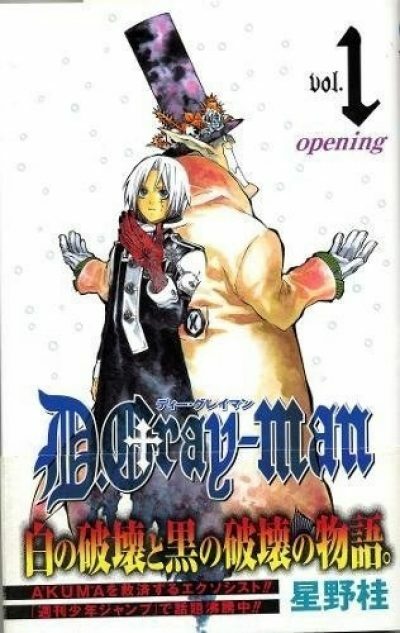 D.Gray-Man, volume one is available here (Amazon) and here (Chapters-Indigo).